Pretty soon you will be getting a new design update for your Gmail app residing on your Android and iOS devices. 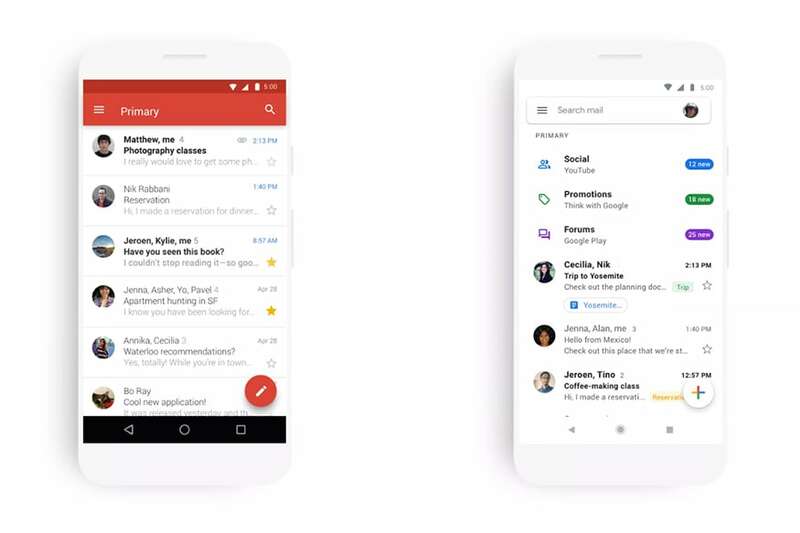 Google is bringing its new latest Material design to the popular email app which is similar to some of the elements you might have seen on Google Assistant, stock Android 9.0 Pie and the recently updated G-Suite set of apps. It looks a bit cleaner now with coloured icons and labels all around. While there is no dark mode, it seems that Google is now one step closer in bringing that feature. Since the new app has a more minimalistic interface with a black-on-white theme, it won’t be long before it is reversed bringing a theme that puts less strain on the eyes and battery life. If you look at the new app side by side with the older version, you can see that the red bar at the top is gone and has been replaced with a search box along with user-profile icon on the top right corner. Clicking on the icon lets you switch between accounts easily. You also get the ability to view attachments like documents and images faster without having to scroll through your email threads and conversations. Google has also added a security feature where users get a red warning sign on emails that seem to be unsafe or malicious. The update (v9.1.13.231319729) was released yesterday, so you should probably get in a couple of days as the roll-out usually takes time to reach all regions. If you can’t wait to try out the new update, you can try to grab the installation APK file from a reliable source and install on your Android device.